First I went through the Burger Phase, now it’s the Pasta Bake Phase. 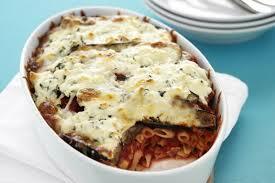 Here is yet another fantastic Pasta Bake Recipe. This Eggplant Pasta Bake is great for Vegetarians and those of us who like something just a bit different every now and then. Not too many ingredients to deal with here either. Rather simple and quick from prep to serving. Preheat oven to 180°C. Grease a 6-cup capacity ovenproof baking dish. Combine ricotta and basil in a bowl. Set aside. Cook pasta in a large saucepan of salted boiling water according to packet directions or until al dente. Drain well and spoon into baking dish. Meanwhile, heat oil in a large non-stick frying pan over medium-high heat. Cook eggplant for 3-4 minutes, turning occasionally, until golden brown. Drain on paper towel and set aside. Pour pasta sauce over pasta and arrange eggplant on top. Place spoonfuls of ricotta mixture on the eggplant and sprinkle with grated mozzarella. Bake for 20 minutes or until heated through and cheese is golden brown. That’s right, eat more vegetables. I know, sometimes it is hard and we’re adults. Children can also be known as fussy eaters too. The best way to get vegetables into the fussy ones is to disguise them and add a bit of cheese. It works with me! Recipes like this though are a tasty way to get your daily hit of vegetables. 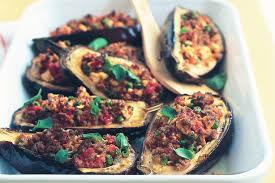 The Basic Bolognaise Sauce is the base for the Stuffed Eggplants and can also be used with other vegetables as well. Try this and see how you go.